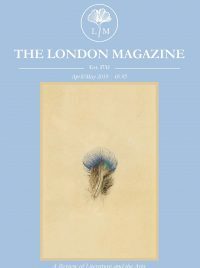 SALON, Saatchi Gallery’s commercial exhibition space, launched earlier this year aiming to present the work of leading international artists who have had limited exposure in the UK. 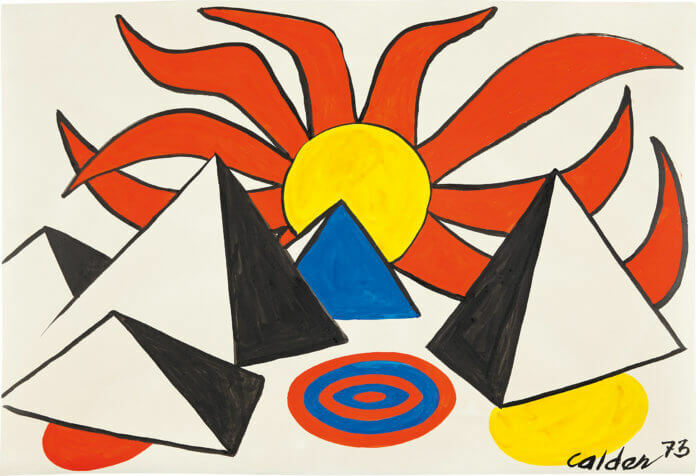 Its latest exhibition Calder on Paper: 1960 – 1976 is staged in collaboration with Mayfair’s Omer Tiroche Gallery and presents a large variety of Alexander Calder’s vibrant gouaches on paper. The white walls of the SALON Gallery are brought to life by these colourful and jazzy images created by Calder (1898-1976) during the 1960s and 70s, and one of his infamous mobiles hangs from the ceiling for good measure. In the late 1920s, Calder pioneered a new method of sculpting and manipulating wire to ‘draw’ figures/shapes in space in tune with early constructivist art as well as abstract painting. It was after coming into contact with Surrealism that Calder took an interest in organic movement; he cited Miró as an important influence and his work exhibits the same buoyancy, wit and whimsy, conveying a sense of movement through serpentine, unbroken lines. Indeed, his kinetic sculptures aimed to capture the constant motion of life and Marcel Duchamp was the first to describe these works as ‘mobiles’. Calder’s gouaches reveal a mastery of line, balance of composition and a preference for primary colours. These elements combine to form pulsating works of art often abstract in nature. As the extract above from Calder makes clear, it was not a specific conception of his own that needed to be passed to the viewer, as long as the image allowed the viewer to form their own connections and associations. Indeed, the SALON exhibition presents a wide variety of gouaches made during the last sixteen years of his life, thus combining a mature language of shapes and forms which almost act as symbols albeit non-prescriptive. The works continue the angularity and kinecticism present in his sculptures, presenting a synthesis of these geometric forms with representational subjects. A regular feature are pyramids (a recurring motif following a flight over Egypt) which appear among fiery suns and spiralling vortices. 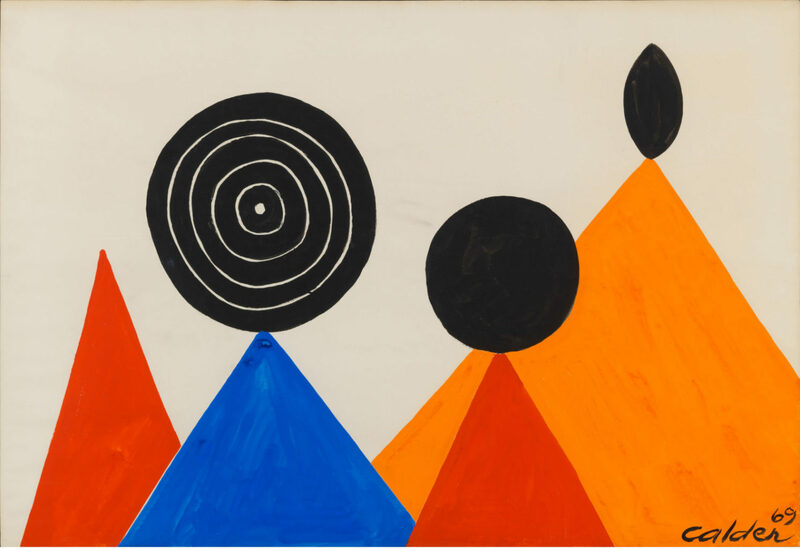 These works really do give a glimpse of Calder’s personal observations and impressions of the solar system, the animal world, primitive civilisations and basic geometric figures such as spirals, circles and triangles. Delighting in nature and evoking the subconscious, Calder celebrated essential yet enigmatic forms in an array of ochres, yellows, and vermilion, a vivid palette reserved for a lifetime of spontaneous impressions. Often creating new forms and works by rearranging his extant visual vocabulary, he maintained a sense of playfulness and humour throughout his career. Alongside this presentation, Omer Tiroche Gallery, Mayfair, London, will show a collection of earlier works on paper by the artist dating from 1939 to 1959. Exhibiting work from two separate periods of Calder’s career serves to create a comprehensive retrospective of his gouaches. It also ensures that a greater number of works will be on display across the two spaces – both familiar and unfamiliar to the viewer – which in turn greater elucidates Calder’s contribution to the development of modern art.